Beyond the hype of its advertising, Microsoft's Origami architecture was sold as the definitive answer to Ultra Mobile PC technology. Here, we were promised, was an iPod beater and more; finally a solution to our ever converging needs. 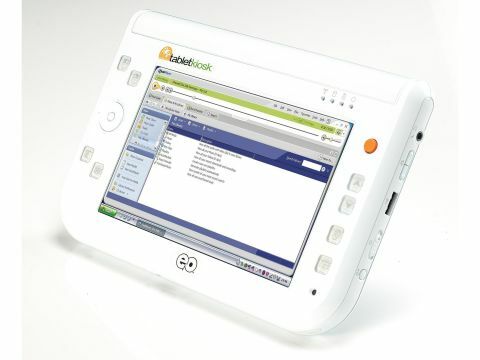 The eo v7110 from TabletKiosk is one of the first UMPCs to hit the UK's streets. Together with the Samsung Q1, it's the first UMPC to make use of Microsoft's Origami architecture, meaning its TouchPack input method is via a touch screen rather than a dedicated keypad or stylus. Similarly to the Q1, the eo's 512MB of RAM, 40GB of hard drive and seven-inch display seems pretty much the standard for a UMPC. Unlike the Q1, however, the eo is powered by a VIA C7M NaNo processor running at 1Ghz, and not a super low voltage offering from Intel's Centrino line. The eo's core specifications suit a UMPC. 512MB of RAM fi red by the VIA chip makes XP Tablet edition run quickly and solidly. Documents are saved and retrieved easily from the 5,400rpm hard disk, media files show little delay in playback, and heavy tasks are undertaken without fuss. 40GB may be taken up quickly by assorted media files and work documents, but configurations of up to 160GB are available as an upgrade. In terms of design, we spot a UMPC trend emerging. Like the Q1, the seven-inch screen is flanked by an inch of plastic all the way round with a power switch, Bluetooth and Wi-Fi radio switch, and two USB ports along the sides. The depth of the eo makes it comfortable and balanced to hold, and though not heavy, it has a reassuring weight. Negotiating Windows via the stylus is straight forward, and the UMPC handwriting recognition software makes inputting fairly simple. An orange touch sensitive button mouse positioned under your right thumb is comfortable and easy to use, and 'left' and 'right' mouse buttons sited under your left thumb make perfect sense. There's also a button style jog-wheel on the left of the device, which is excellent for scrolling through documents and Web browsing. However, the true beauty of UMPC architecture was promised in the TouchPack software, designed to lay a QWERTY keypad across two touch-sensitive semi circles at each bottom corner of the screen. Here the eo disappoints, with the TouchPack software let down by a degree unresponsiveness from the screen and a clumsy input method. The biggest question UMPCs have been facing is that of battery life. While the Q1 and forthcoming Asus UMPC opt for an ultra low voltage chip, here TabletKiosk have chosen the VIA. While it's more than powerful enough, it just doesn't fit the UMPC bill. In practise, the battery life isn't quite the disaster predicted, clocking in at just less than two hours. However, the eo v7110 does generate a considerable amount of heat, making extended hand-held use no where near as comfortable as other UMPCs. These two niggles might not be the bottom line, but a UMPC is meant to be a 'go anywhere, do anything' device. Although it holds up well as a truly portable PC, it does so with some rudimentary yet significant failings.